"No, you can't have my vintage vhs copy of 'Tremors'!" In the photo above, the closet makeover is not 100% complete, but its getting there. The new space acts as a little reading/play nook for my kids, which they love- its very fort-like, and if I have to do any computer work while at home, they're inches behind me, so that I can keep an eye on them. 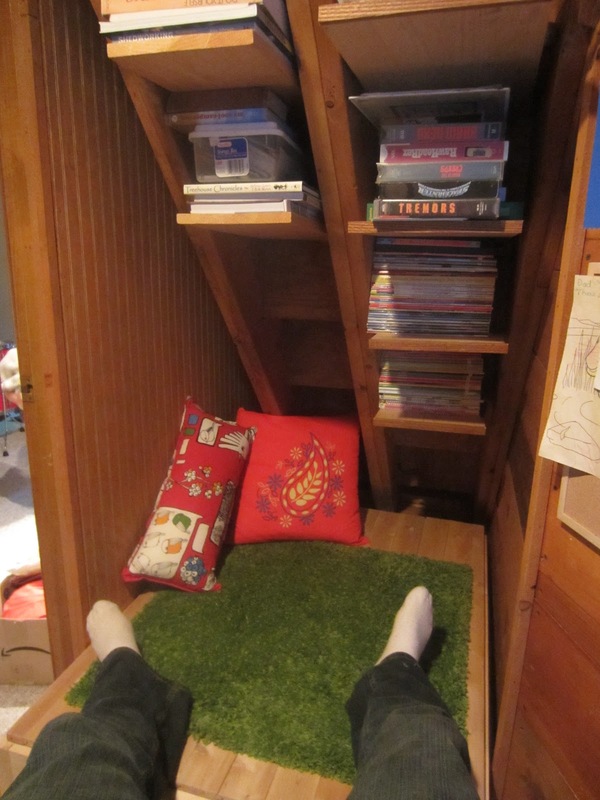 Basically, I utilized the under-stair shelving I had installed (on stairs I also had built a few years ago, the office too...) for storage of books, magazines, and future giveaway items for the blog, AND.....I built what I call "FLOORAGE". Floorage is the building of a thin, boxed, floor section, ON TOP of an existing floor. Its almost like building a stage, but one that is hollow, and opens up for access and storage within. Mine was made of a few 2by6's and some left over tongue and groove cedar I had. Slap an Ikea rug and a pillow or two on top of that, and Whammo!- a simple under-stair-office makeover! Naturally, some of the items I parted with, or moved elsewhere, but believe it or not, most everything fit in here, AND there's a little room to spare... The edge of the storage/floorage box also has a nice stained/trim edge now, which isn't shown in this photo.